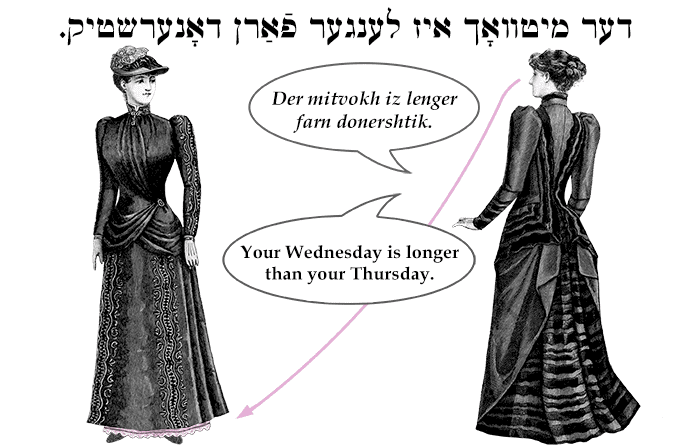 Yiddish Expression: Your Wednesday is longer than your Thursday. דער מיטוואָך איז לענגער פֿאַרן דאָנערשטיק. Der mitvokh iz lenger farn donershtik. Your Wednesday is longer than your Thursday. Your slip is showing. SOURCE: Stutchkoff, Der Oytser fun der Yidisher Shprakh.